Bringing the optimism of the 1960s-era space race to life through exhibits, a planetarium, and an observatory, the H.R. Macmillan Space Centre is one of Vanier Park’s top tourist attractions. Set in a picturesque oceanside setting in Kitsilano, Vancouver’s relaxed hippyish neighborhood, the Centre is easily accessible from Downtown Vancouver. 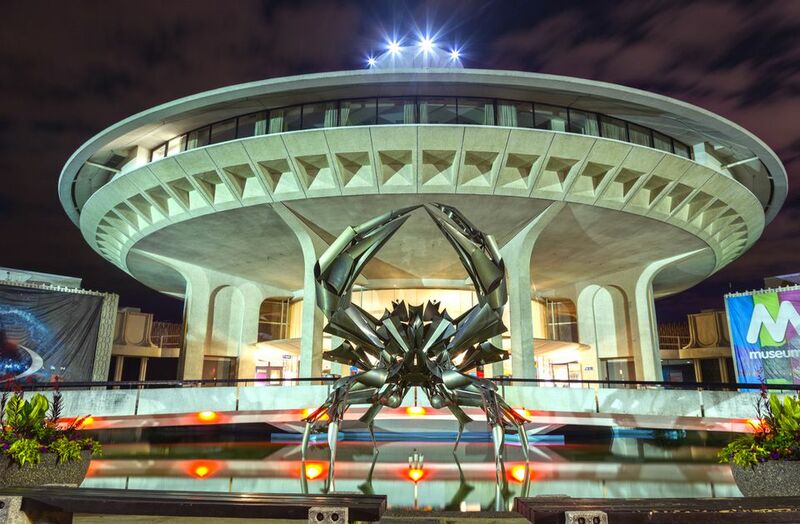 Only a 15-minute walk from Downtown Vancouver, the unusual UFO-style building has been part of the Kitsilano waterfront since the 1960s. Philanthropist and lumber magnate H.R. MacMillan gifted the Planetarium Theatre to the city on October 28, 1968, to celebrate the era of space exploration. In 1997, a new exhibit gallery and demonstration theatre opened to expand the building into its current incarnation as the H.R. MacMillan Space Centre. It’s easy to spot the futuristic looking Space Centre, which even today looks like a spaceship from another dimension. Retaining the retro charm of its optimistic 1960s roots, the Centre is a popular weekend treat for local children and can be busy with school groups during the week. Although it’s not the most high-tech space museum in the world, there is something beautifully nostalgic about the Centre. Inside you’ll find a fascinating look at all things space-related, and next door to the Space Centre, you’ll discover the Gordon MacMillan Southam Observatory, which is open on Saturday nights from 7:30 p.m. until 11:30 p.m., with admission by donation. It features a half-meter Cassegrain telescope to showcase Vancouver’s skies and hopefully see planets, moons, and star clusters. Staff members are on hand to help you interpret what you see and tell you more about the amazing astronomy that can be discovered above the city. Most exhibits are ideal for all ages, although the recommended age to understand the live science shows is 6 years and older. There are plenty of exhibits to fill a half to full day of fun at the Space Centre. The Planetarium Star Theatre shows incredible depictions of planets, meteor showers, nebulas, black holes, galaxies, and other astronomical wonders. Shows change regularly so you can return again and again to see something different. The Cosmic Courtyard Gallery showcases fun space-themed content, and some highlights include the photo op in a spacesuit on another planet, the chance to lift a real meteorite (or at least, attempt to), and your opportunity to touch a 3.75 billion-year-old moon rock (one of only five touchable moon rocks in the world). Visit the GroundStation Canada Theatre for live science and space shows that cover everything from geology to astronomy, meteorites, and surviving on Mars. Age suggestions apply depending on the show, but most are suitable for ages 6 and up. As well as educational group visits, the Space Centre also offers overnight adventures and hosts special events. Cosmic Birthday Parties can also be organized for a space-themed celebration. Weddings can also be arranged if you’re planning a destination wedding! False Creek Ferries runs little boats from Granville Island and the Aquatic Centre (near Burrard Bridge) that arrive at Vanier Park’s pontoon, close to the Space Centre. Buses also run along Cornwall Avenue, and parking is available by the Space Centre and Maritime Museum. The #2 and #32 buses stop within a five-minute walk from the Centre. Walk or cycle along the seawall to reach the Space Centre via pedal power. The Space Centre is a five-minute walk from Kitsilano Beach, a 10-minute walk from Granville Island, or a 15-minute walk from Downtown. Daily hours are 10 a.m. to 5 p.m., with evening hours on Saturdays, including Planetarium shows at 7:30 p.m. and 9 p.m. Observatory hours are 7:30 p.m. until 11:30 p.m. Adult entry is $18 (aged 19-54), seniors (over 55) and youth (12-18) are $15, children 5 to 11 are $13, and under 5 is free admission. Daytime admission includes one Planetarium Star Theatre Show, plus unlimited access to GroundStation Canada Theatre and the Cosmic Courtyard Gallery. Evening admission costs $13 (adults), $10 (youth and seniors), and $8 for children over 5 and includes one Planetarium Star Theatre Show and an Observatory visit. Observatory-only admission is by donation.